When Louis XVIII, King of France, returned to his country to ascend the throne after Napoleon’s 1814 abdication, he sailed from England, his home for the preceding seven years. The King’s younger brother, the Count of Artois (future King Charles X of France), had lived in England for even longer. In fact, the entire French royal family lived in England throughout much of the Napoleonic Wars, generously subsidized by the British government. Louis XVIII (then known as the Count of Provence) escaped from France in June 1791, at the same time that his older brother, Louis XVI, and his family tried unsuccessfully to flee the country. The Count of Artois had left France two years earlier, shortly after the storming of the Bastille. With a small court of émigrés, the Count of Provence took refuge in Brussels, then in Coblenz, and then in Hamm, Westphalia. In 1795, upon learning of the death in prison of his nephew, Louis-Charles (son of Louis XVI and Marie Antoinette, who were executed in 1793), Louis XVIII proclaimed himself the rightful King of France. As the reach of Republican France, and subsequently Napoleon’s Empire, expanded, progressively fewer courts were willing to host the exiled French royal family. 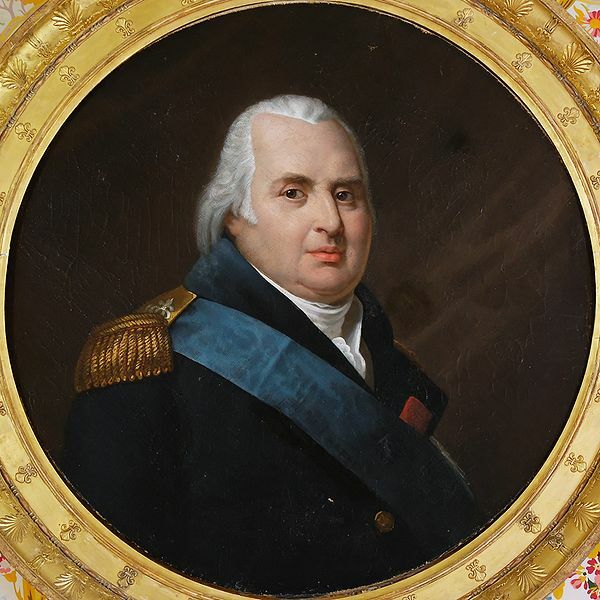 Louis XVIII and his entourage shuffled to Verona, Blankenburg, Mittau (Jelgava), Warsaw, and then – in 1805 – back to Mittau, which was under the rule of Tsar Alexander I of Russia. Meanwhile, the Count of Artois, with his own followers, went to Britain. In July 1807, Tsar Alexander signed the Treaty of Tilsit with Napoleon. Knowing he was no longer safe in Mittau, Louis XVIII went to Sweden to consult with King Gustavus IV Adolphus. Louis was in need of money, as the pension he had been getting from Spain – now under Napoleon’s control – had stopped. He was also jealous of his brother, Artois, who was receiving British subsidies and directing a network of royalist agents. Louis travelled to Gothenburg where he embarked for Britain on the Swedish frigate Freya. The government let him disembark on the condition that he abstain from political activity and reside at least 50 miles outside London. After being greeted by the Count of Artois and the other Bourbon princes (Prince of Condé and Duke of Bourbon) already in England, Louis proceeded to the mansion of Gosfield Hall in Essex, offered to him by the Marquis of Buckingham. In August 1808, Louis was joined by his wife, Marie Joséphine of Savoy, and his niece, the Duchess of Angoulême (daughter of Louis XVI and Marie Antoinette), who had remained at Mittau. To accommodate them, he moved to Hartwell House, near Aylesbury in Buckinghamshire. Hartwell belonged to the Reverend Sir George Lee, Baronet. Louis took it on a five-year lease. Diarist Charles Greville described a visit to Hartwell with his father in 1812. The house is large, but in a dreary, disagreeable situation. The King had completely altered the interior, having subdivided almost all the apartments in order to lodge a greater number of people. There were numerous outhouses, in some of which small shops had been established by the servants, interspersed with gardens, so that the place resembled a little town. After our audience with the King we were taken to the salon, a large room with a billiard table at one end. Here the party assembled before dinner, to all of whom we were presented – the Duchesse d’Angoulême, Monsieur the Duc d’Angoulême, the Duc de Berry, the Prince and Princess de Condé (ci-devant Madame de Monaco), and a vast number of ducs, &c.; …. At a little after six dinner was announced, when we went into the next room, the King walking out first. The dinner was extremely plain, consisting of very few dishes, and no wines except port and sherry. His Majesty did the honours himself, and was very civil and agreeable. We were a very short time at table, and the ladies and gentlemen all got up together. Each of the ladies folded up her napkin, tied it round with a bit of ribbon, and carried it away. The French royals also did some sightseeing during their years in England. They visited, among other places, Blenheim, Oxford, Woburn Abbey, Arundel Castle, the Isle of Wight, Cheltenham, Gloucester and Bath. Though it was reported that “the unfortunate Prince [did not have] patrimony of his own sufficient to buy himself a brown loaf,” Louis XVIII had some family jewels, an annual British pension of £16,000, and the equivalent of £1,600 a year from Portugal and £4,000 from Russia. (8) When Louis’s wife, Marie Joséphine, died of edema at Hartwell House on November 13, 1810, the British government paid part of the cost of her funeral, which was held at Westminster Abbey. The Prince of Wales (future King George IV), a strong supporter of the Bourbons, promised to restore Louis XVIII to the French throne at a time when few thought such a feat was possible. On June 19, 1811, Louis XVIII and his family were the guests of honour at the Prince’s lavish fête at Carlton House in London, to celebrate his new position as Prince Regent of Britain. Some 2,000 guests attended. The august personages arrived about ten o’clock in the evening, and were received in a room reserved expressly for them, hung with sky-blue satin embroidered with fleurs-de-lys in gold. This refined attention seemed to express, in an ingenious allegorical manner, the peace and prosperity which will one day, and perhaps before long, be for the universe the result of the re-establishment of legitimate authority in the place of the present disorder…. Not everyone felt warmly about the presence of the King of France and his family in England. The Bourbons received various threatening letters, extracts of which were released to British papers. You are of a bad Race, mercy is in the Protestant, you imposing Vagabonds Die by nostra manns. I visit your House every week you damn’d Villain – look at your Effigie inclosed. Bone has offered a Dutchy for your Head he shall have it. Mind, a good Boat and many of us Prisoners of War will seize on you, put you into it at Yarmouth you Enemy of Europe. A Man can die but once you Vagabond Louis. Your proceedings will not do, our intentions have been delayed in hopes of something being abjured or done on your part and the Prisoners of War your countrymen, restored to their Native land our party increase very strong against you and only temporize for a time, but many are near your own Person of our Party which makes us sure of our designs. So if I do not get my Friends home you shall be arrested, murdered, shot or slain. Charlotte Corday shall visit you first. You are at our Bar and renounce, adjure, or die by our hands. You shall be attacked from us in our Prison Wincanton, Crediton, Tiverton, and other Places. In the House of Commons, Foreign Secretary Lord Castlereagh denied any British participation in the proclamation and said he had no intention of making the restoration of the Bourbons the basis of peace negotiations between the Allies and France. At the same time, the British government provided Louis with the financial means to print the declaration, and there were rumours that copies had been sent on board British ships for distribution on the coast of France. Dispatches from Hartwell House to European capitals were carried by British couriers. On March 12, British and Portuguese troops under the Duke of Wellington arrived at Bordeaux. The Duke of Angoulême, who had been for some time at Wellington’s headquarters, made a triumphant entry into the city. On March 31, the Allies entered Paris. On April 6, 1814, Louis XVIII was proclaimed King of France. On April 20, dressed in the uniform of the Marshals of France, his hat surmounted with a plume of white feathers, the King of France left Hartwell. He was accompanied by the Duchess of Angoulême, the Prince of Condé, the Duke of Bourbon and their households. They were met by the Prince Regent at Stanmore. The party continued to London in a procession of six royal carriages, each drawn by six horses ornamented with white ribbons, together with outriders and attendants. On the entrance of the procession into Hyde Park…the motion of the crowd in the wide part of the park became like a torrent. The procession arrived at Hyde Park Corner exactly at half past five o’clock, and proceeded along Piccadilly at a slow pace, amidst the shouts of the populace and congratulations of crowded houses, the compliments of the royal party at Pulteney Hotel, &c. Among the emblems of rejoicing, Devonshire House was the most conspicuous: over each gate were new English and French colours, and boughs of laurel. A little before six o’clock, the cavalcade arrived at Grillon’s Hotel, Albemarle Street. The band of his Royal Highness the Duke of Kent was stationed near the hotel, who played, ‘God save the King’ as the distinguished persons alighted. 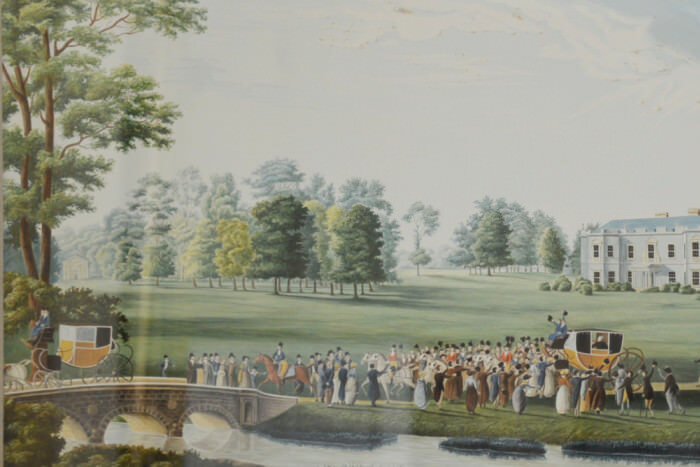 As the carriage with the cream-coloured horses approached, in which were his Majesty Louis XVIII, and his Royal Highness the Prince Regent, the people unanimously huzzaed, the ladies from the windows waving their handkerchiefs. His Majesty had hold of the Prince’s arm, who conducted him to the principal apartment prepared for the French monarch by the especial order of the Prince Regent, fleurs de lis being embroidered in gold upon hangings of crimson velvet. In this superb room, the Earls of Buckinghamshire, Bathurst, and Liverpool, the Russian, Austrian, and Spanish Ambassadors, and about one hundred and fifty of the ancient French Noblesse were in attendance to receive his Majesty, who seemed much fatigued, an arm chair was brought, in which his Majesty seated himself, the Duke of York on his left, his Royal Highness the Prince Regent and the Duchess d’Angoulême on his right, the Prince de Conde and the Duc de Bourbon facing him, with all his suite surrounding him. The Marquis of Hertford and the Earl of Cholmondeley were behind the chair. The King of France then invested the Prince Regent with the Order of Saint Esprit. Later, at Carlton House, Louis XVIII was elected a Member of the Most Noble Order of the Garter and given a Knighthood. The Prince Regent received the King of France and his companions on board the royal yacht the Royal Sovereign, which he was lending for the trip to France. The yacht was escorted by the British frigate Jason, under the Duke of Clarence (Admiral of the Fleet and future King William IV), and the French frigate Polonais. On April 24, the King of France and his entourage set sail. The Duchess of Angoulême was on deck, waving a white handkerchief and kissing her hand, saying farewell to the inhabitants of England. Two hours and ten minutes later, the ship arrived at Calais. Twenty-three years after leaving France, Louis XVIII was back home. He had to leave again 11 months later, when Napoleon escaped from Elba. That exile was only a few months, spent in Ghent. Louis XVIII never returned to England, but he always had fond memories of the country. Among other things, he kept at the Tuileries Palace the white wooden desk he had used at Hartwell House. He is sitting at it when he learns of Napoleon’s (fictional) escape from St. Helena in Napoleon in America. The Count of Artois, who in 1824 succeeded Louis XVIII as Charles X, did return to Britain. He and his family sought asylum there when they were exiled after the French Revolution of 1830. The Bourbons lived at Holyrood Palace for two years, before moving to Prague. They never regained the French throne. The Morning Chronicle (London), November 2, 1807. Caledonian Mercury (Edinburgh), November 5, 1807. The Ipswich Journal (Ipswitch), November 14, 1807. The Hull Packet and Original Weekly Commercial, Literary and General Advertiser (Hull), August 16, 1808. The Morning Post (London), November 10, 1809. The Cheltenham Chronicle and Gloucestershire Advertiser (Cheltenham), December 10, 1812. Charles C. F. Greville, The Greville Memoirs, edited by Henry Reeve, Vol. II (London, 1874), pp. 345-346. The Cheltenham Chronicle and Gloucestershire Advertiser (Cheltenham), September 3, 1812. Philip Mansel, “From Coblenz to Hartwell: the Émigré Government and the European Powers, 1791-1814,” in The French Émigrés in Europe, and the Struggle against Revolution, 1789-1814, edited by Kirsty Carpenter and Philip Mansel (London, 1999), p. 13. The Morning Chronicle (London), June 25, 1811. The Times (London), September 10, 1811. The Morning Post (London), March 13, 1813. The Morning Chronicle (London), March 10, 1814. Caledonian Mercury (Edinburgh), April 25, 1814. The Times (London), April 25, 1814. The Hull Packet and Original Weekly Commercial, Literary and General Advertiser (Hull), May 3, 1814. Evidently Napoleon did not understand the VIKING HANSEATIC TRADE LEAGUE. To preserve the CONTINENTAL SYSTEM he did not need to get bogged down in the vastness of RUSSIA. He could have taken DENMARK to control the access to the BALTIC SEA. SCANDINAVIA and ENGLAND would surely react, perhaps less effectively than RUSSIA. As always, immaculately researched and presented. 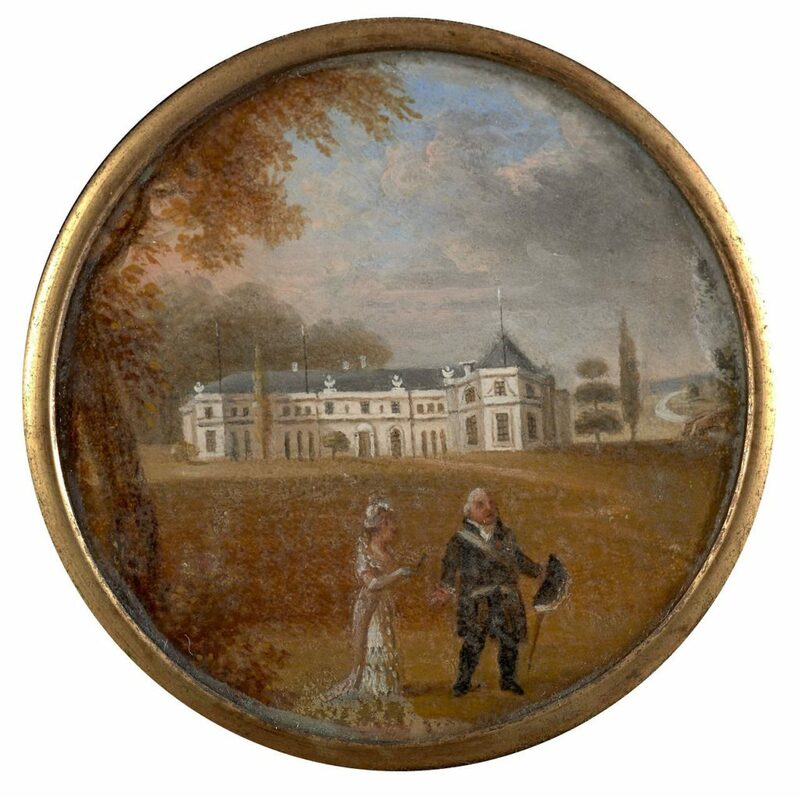 The Count de Lille appears greatly delighted with the residence of Gosfield, which presents a very striking contrast to the bleakness of the country which he has quitted. He walks a great deal; but, from his size, has now left off riding.